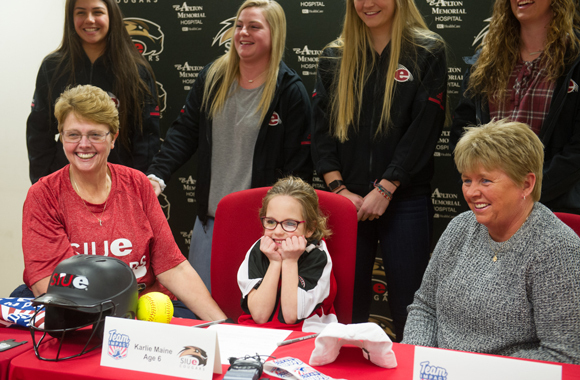 Karlie Maine, of Alhambra, has battled myriad medical issues and now joins SIUE softball as part of Team IMPACT. Since 2011, Team IMPACT has matched more than 1,300 children facing serious or chronic illnesses with more than 500 colleges and universities in 47 states, reaching more than 35,000 participating student-athletes. “Any time you have an opportunity for your team to participate in the enrichment of another person’s life, that’s really important,” said SIUE Head Coach Sandy Montgomery. With the official signing Thursday, Maine and her family gain an SIUE softball team full of partners ready to provide emotional support. Throughout this journey, the goal is to give Maine camaraderie, strength and support. For the SIUE softball team, it’s an opportunity to bond with someone who already has lived day-to-day courageously and with resilience. Jill Niehaus, Alana Cobb-Adams, Zoe Schafer and Reagan Curtis stepped up to be “team captains” for Team IMPACT and their interactions with Maine. “I love being around kids, and I have two younger siblings, so being around her is like having my little sister around me,” said Cobb-Adams, a freshman from Kapolei, Hawaii. Maine already has visited Cougar Field and spent some time with the softball team at SIUE’s Fulginiti Indoor facility. The signing event is just the start for Maine.